Offering modern tranquility, Apex House is the perfect destination to unwind in simplicity with all the luxuries you would expect. This spacious, open plan eco home is perched on a peaceful hill at the top of Bright with mountain views and a sunny aspect. Relax on your large deck while the kids run around on the lawn or cruise a short stroll down the road to the Bright splash park and playground. Your sunny living area progresses from your fully equipped kitchen to a cosy lounge area with gorgeous open fire and large flat screen television. 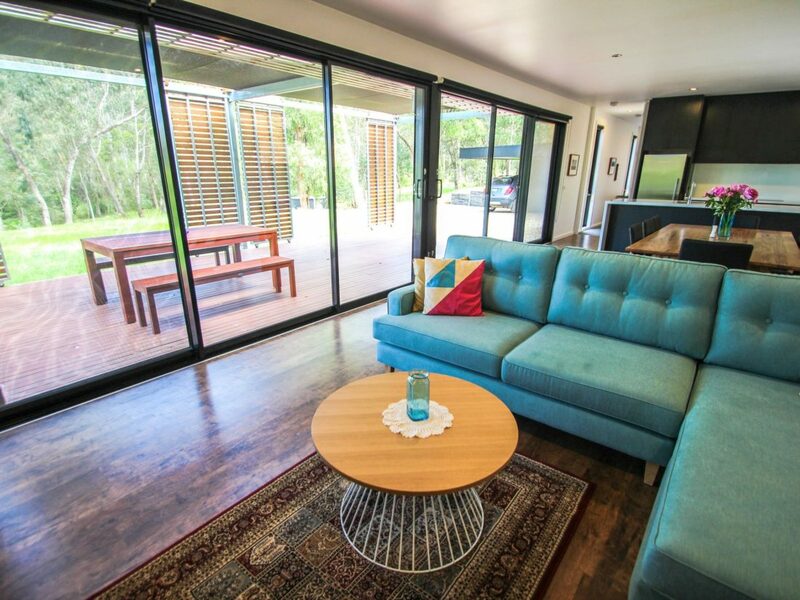 Reverse cycle heating and cooling offers year round comfort or slide the huge doors open to let the cool afternoon mountain air flow through on a hot summers day. Feed the family from your modern kitchen with quality appliances, enjoy a barbecue on the deck or indulge in Bright’s restaurants and cafes. Three roomy bedrooms can sleep up to eight guests – six adults at a maximum. The two master rooms each feature a queen bed with robes. The third large bedroom, ideal for the little people offers two bunks and a full size cot. Each bedroom has reverse cycle heating and cooling and easy access to one of two bathrooms. Your two stylish and modern bathrooms include showers and baths and are ideally situated for two couples. For extra convenience, your full laundry features a washer and dryer and room for jackets and gear. The ideal place to unwind, rejuvenate and catch up with loved ones, the simple modern styling of Apex House will ensure you leave relaxed and refreshed.